Wednesday, August 5 from 6:30 p.m. until 9:30 p.m.
Reverend Dr. T. Kenjitsu Nakagaki, a Japanese Buddhist Priest who is the President of the Buddhist Council of New York and the Vice Chair of the Interfaith Center of New York, will lead an Interfaith ceremony with local Christian, Buddhist, Shinto, Jewish, Hindu, and Muslim leaders to commemorate the 70th anniversary of the atomic bombings of Hiroshima and Nagasaki. 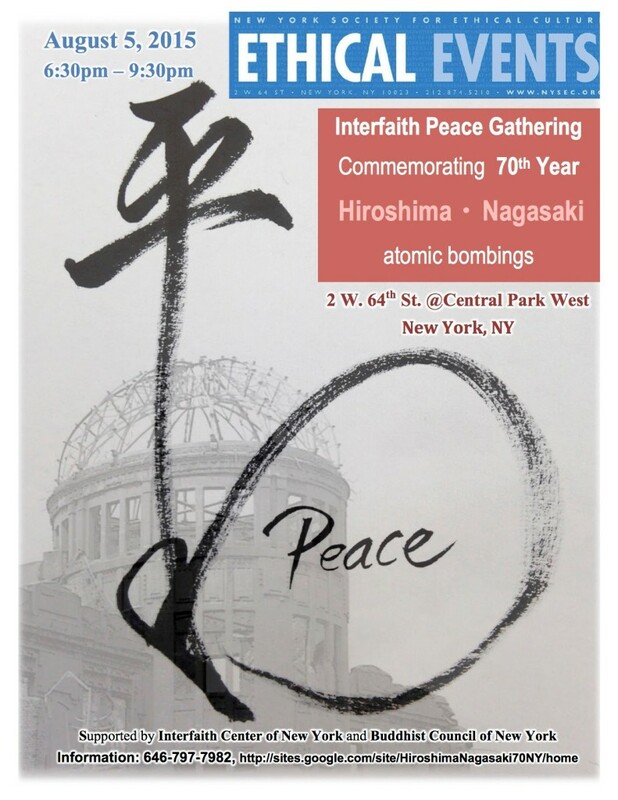 Co-sponsored by New York Society for Ethical Culture and supported by the Interfaith Center of New York and the Buddhist Council of New York, the Interfaith Peace Gathering puts a human face on the terrible destructiveness of nuclear weapons. Special guests will read messages from the Mayors of Hiroshima and Nagasaki, and Hiroshima native Tomiko Morimoto West will share her story of survival. At 7:15 p.m., the exact moment of the Hiroshima bombing (Japan time 8:15 am on August 6) bells for peace will be rung. The ceremony is the highlight of a series of special events involving the commemoration of Hiroshima and Nagasaki. From July 31 through August 9, there will be a photography exhibition at West Park Presbyterian Church (165 W. 86th Street at Amsterdam Avenue) with Paule Saviano’s portraits of survivors of the atomic bombings that are featured in his book From Above, as well as photographs of artifacts from the atomic bombings by Yusaku Kanagawa and Ken Mizokoshi. Saviano will give a talk at the Opening Ceremony on July 31. 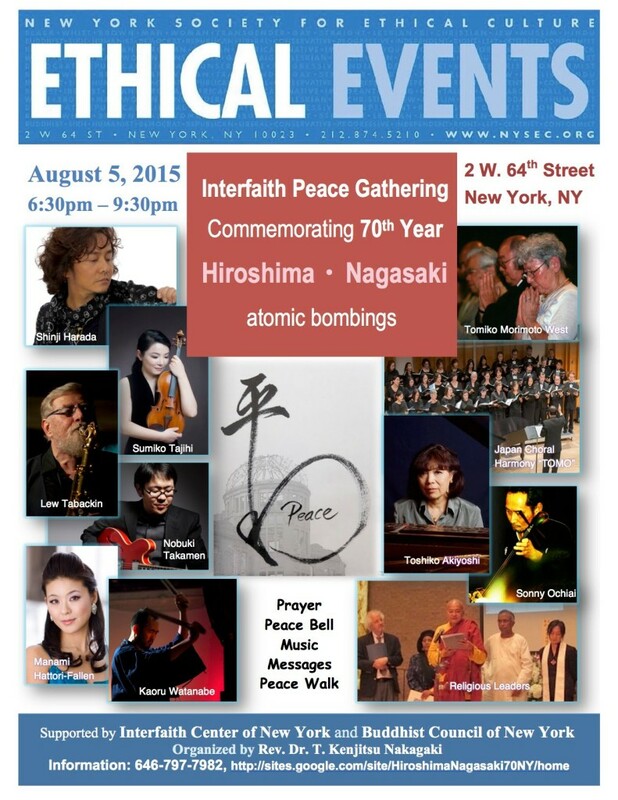 On August 8 there will be a program of Peace, Art and Music with Harada and Japanese Choral Harmony “TOMO” followed by a live telecast of the Nagasaki Peace Ceremony at Advent Lutheran Church/Broadway Church (2504 Broadway at W. 93rd Street). The Closing Ceremony on August 9 will include a performance by Harada and a talk by visual artist and sculptor Natsuko Hattori, whose works will be on display onstage at New York Center for Ethical Culture. There will be origami workshops led by Toshiko Kobayashi of the Origami Therapy Association and screenings of short films throughout the week. For mote information and a full schedule, please visit the website for this year’s peace events.